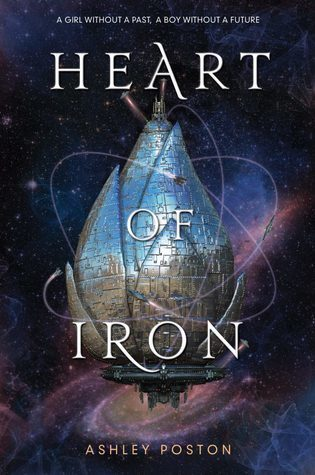 Review In A Nutshell: Heart of Iron is an extremely fast-paced read, full of mystery, adventure, and action, all set in a fascinating sci-fi universe. But at the heart, this book is truly about home, love, family. Heart of Iron follows four different characters and is a loose, sci-fi retelling of Anastasia. I’ve recently become obsessed with Anastasia, so this premise really did hold the key to my heart. First, there is Ana, who was found as a child with no memories of her past and raised by a crew of outlaws. She was found with D09, also known as Di, a Metal who is suffering from severe glitches and may not be able to function for much longer. Then there are Jax and Robb. Jax is the pilot of the outlaw ship the Dossier, and Robb is an Ironblood, a royal mess, who is looking to see if his father survived the rebellion so many years ago. The same rebellion that killed the royal family including the young Ananke, who was thought to be the Goddess herself. When Robb and Ana collide while searching for the same coordinates, Ana has no choice but to journey to the past to discover things about her she never would have thought could be true. Since this is a sci-fi story, there are a few different planets and species to understand, however, the setting was never really that big of an aspect of the book. While the locations the characters went to were explained well, there isn’t much explanation of the rest of the universe. This was something I expected going in, considering Ashley Poston had previously only published a contemporary and she really just had to jump in and learn to do it. This isn’t a bad thing, the focus is instead on the plot and characters, which I enjoyed. The writing style was descriptive and very fun to read, but despite the technology and science aspects, a lot of this book focused on court and politics. This does make sense since it’s based on Anastasia, which is a historical fiction with just a touch of fantasy. The plot was extremely fast-paced, to the point where it did feel a little jarring jumping into it. There is constant action and not a slow moment in the book. However, this does lead to some of the relationships to feel a little rushed. After less than a hundred pages through the book, it starts to feel more natural, but it does take a second to adjust. This does, however, make the book almost impossible to put down. Despite how much you know about Anastasia and think you know exactly what will happen, there is an abundance of unpredictable turns. A lot of the story differs from the original tale, which is really important for good retellings. No matter how badly I want a word for word YA book version of Anastasia (someone please write that! ), what Poston added and changed really makes it stand out. Less of this book revolves around the rumor and the legend, instead focusing more on the mystery of the rebellion and what truly happened that night. The characters in this book are so fun to read about. While, as I mentioned before, some of their relationships feel a little rushed, these characters are still awesome, and I still adore the friendships and love stories that this book creates. There are plenty of diverse characters, and a gay relationship so that made me super happy. Ana and Di were adorable, and I was shipping them the whole time. Robb and Jax felt a little more rushed initially, but I don’t care, I still loved them. The rapid switching of point of views may not work for everyone, but I really enjoyed their different perspectives and found it added a lot of suspense (to the point of frustration, but I guess that’s the point).I especially loved reading from Di’s point of view, I found it the most interesting, but this could also be because I just adored Di as a character. There were a lot of great minor characters as well, and all of them were well developed. I swear, every single time there was a scene with Di and EOS I couldn’t help but smile. My only complaint with the side characters was that due to the fast plot, whenever a character died I felt like there was never enough time to really have it sink in, although I guess that would be the same for the characters, so it isn’t that much of a complaint. Also, THAT ENDING!!! Ashley Poston really pulled no punches with that ending and I both love and hate her for it. If you are looking for a fun, action-packed read with cute relationships and a fascinating mystery, Heart of Iron is the perfect book for you. Also, be glad I only included a few unnecessary musical-based puns in this. Now excuse me as I continue to freak out over the ending and continue with my countdown until the sequel is released. Note: This review was originally written for my other blog, and had been written months ago. Follow my blog to see new reviews twice a week, and please be patient as I transfer over old posts to the new website!